We bring to the attention of Global Research readers the selection of articles below which reveals the insidious role of the US and its allies in fomenting war and conflict in the Middle East, not to mention the biased news coverage of the corporate media. Please help us spread this selection of articles by forwarding it far and wide, discussing it within your circle of friends and colleagues, reposting our articles on blog sites and social media, etc. When Yousry Abushady studied the highly unusual May 2008 CIA video on a Syrian nuclear reactor that was allegedly under construction when Israeli jet destroyed it seven months earlier, the senior specialist on North Korean nuclear reactors on the International Atomic Energy Agency’s staff knew that something was very wrong. Why Are We Helping Saudi Arabia Destroy Yemen? The Iranian Supreme Leader Ayatollah Ali Khamenei stated that the cooperation between Moscow and Tehran and the refusal of mutual payments in US dollars could isolate the USA and “repel the American sanctions”. The Supreme Leader added, “It is possible to cooperate with Russia in dealing with large-scale issues requiring commitment and determination, and to cooperate with it logistically”. While not overwhelmingly involved with troops, bombing campaigns, and the like in the way that it is in Syria or Iraq, the United States is nonetheless complicit in the destruction of an entire country by providing intelligence, weapons, and political support to Saudi Arabia and the GCC in their war against the Yemeni people. In addition to that support, however, the United States has, at times, also contributed limited direct military support to the Saudi effort. While a top U.S. nuclear military commander made global headlines over the weekend after he stated plainly on Saturday that he would resist any order from President Donald Trump that he deemed “illegal,” including an unlawful directive to carry out a nuclear strike, experts warn that individual objections such as that could be overcome by a commander-in-chief determined to launch an attack. US/Saudi/Israeli Alliance for Greater Regional Turbulence? 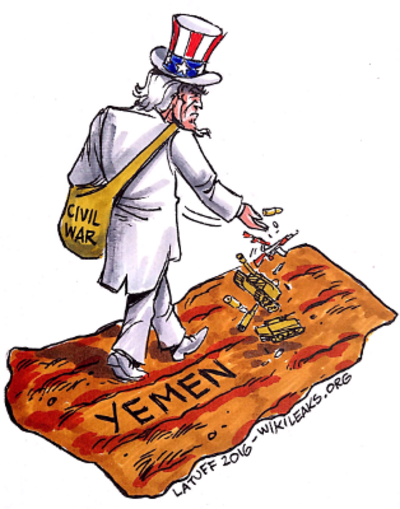 US-orchestrated Saudi war on Yemen only achieved the world’s greatest humanitarian disaster, nothing else. Houthi fighters remain strong and resilient after two-and-a-half years of aggression on the nation.